Laura Catherine Doub was born on December 3, 1887, in the town of Carthage in Moore County, N.C., to William Blake and Josephine Sallie Bryan (or “Josie”) Doub. William B. Doub was a reverend, who was the grandson of prominent Wake County, N.C., Methodist minister Rev. Bennet Taylor Blake. Little is known about her youth, other than the family initially lived in Moore County. By the mid-1890s, the Doub family had moved to Durham, N.C., where Rev. William Doub was the minister at the Main Street Methodist Church. Josie Doub was a music teacher, offering lessons in Durham. Tragedy struck the family when William B. Doub died on August 3, 1896, of typhoid fever, leaving his widow to raise their three daughters and son. Apparently, Josie Doub needed help housing and raising the children. By 1900, Laura Doub, her younger brother Peter, and her other siblings were living with their aunt Isabella W. Bryan, a teacher, in Moore County. By 1910, sisters Laura and Belle Doub were living with their older sister Nannie Doub in Lee County, N.C., where Nannie worked as a high school teacher. Laura Doub was working as a stenographer at this point. By 1918, Laura Doub was living in Rocky Mount, N.C.
Laura C. Doub was inducted into World War I service as a U.S. Army nurse with the Army Nurse Corps on March 20, 1918, from civilian life. She would be stationed at numerous hospitals in the United States and France, including the following. Doub was assigned to Army General Hospital No. 11 to July 9, 1918; then transferred to the Army’s Mobile Station [believed to be in New Jersey or New York City] in preparation for leaving for France, where she remained until July 30, 1918. After sailing with about 100 female Army nurses on a troop transport ship to France in August 1918, Doub would be assigned in France to the U.S. Army’s Base Hospital No. 115, which would be her primary station for her time in Europe throughout World War I. Base Hospital No. 115 was housed in Hotel Ruhl in Vichy, France. 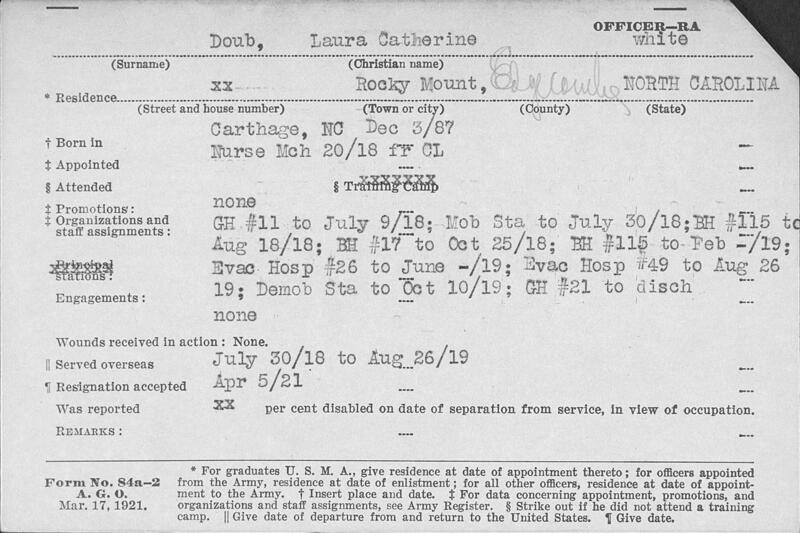 Laura Doub remained there through February 1919, before being assigned to Army Evacuation Hospital No. 26 through June 1919. To learn of the types of work Doub would have performed in an evacuation hospital, read the article “Evacuation Hospital” by Prof. George Thompson, a historian in the University of Kansas Medical Center. Doub would serve in France and Germany with the U.S. Army of Occupation. Next, she was sent to Evacuation Hospital No. 49 through August 26, 1919, when Doub arrived in the United States aboard a troop transport ship. She would return to Rocky Mount on leave for several weeks, staying with her married sister. She was sent to an Army demobilization station, remaining there through October 10, 1919—apparently assisting with medical matters pertaining to returned U.S. Army soldiers from Europe. Doub was assigned to the Army General Hospital No. 21, until she was discharged from active military service. Laura Doub remained in the Army Nurse Corps, until she resigned on April 5, 1921. By 1922, Laura Doub would marry a WWI U.S. Army veteran from Colorado, George Looms, and the couple lived in Denver. By 1926, George Looms was working as the publicity director for the Denver Chamber of Commerce. By 1927, George Looms had died, leaving a widowed Laura Looms to raise their two children alone, even as she worked as a nurse for the Denver Public Schools. Laura Looms remained a nurse for the Denver Public Schools through the 1940s. Nothing is known about her life after 1945. Laura Doub Looms died on September 15, 1972 [she may have been buried in Louisville, KY]. All of Laura Doub’s WWI letters to her family from August 1918 through 1919, are now available online through the WWI collection of the North Carolina Digital Collections, a joint effort of the State Archives of North Carolina and the State Library of North Carolina. 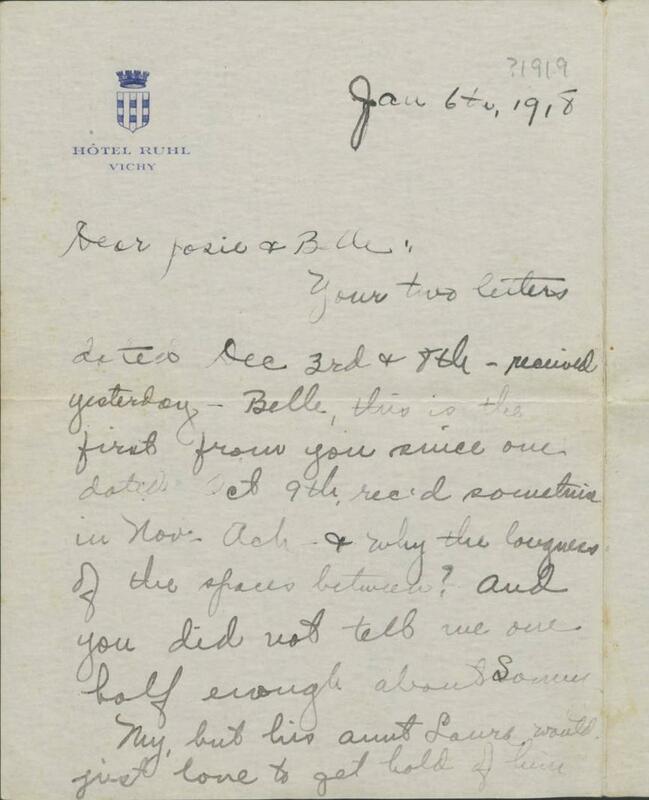 The letters are the most complete set of correspondence from a North Carolina WWI Army nurse about life in Europe before and after the Armistice in November 1918. Her letters document life as a young woman in time of extreme crisis, and are extremely descriptive of the life of an Army nurse during the war. 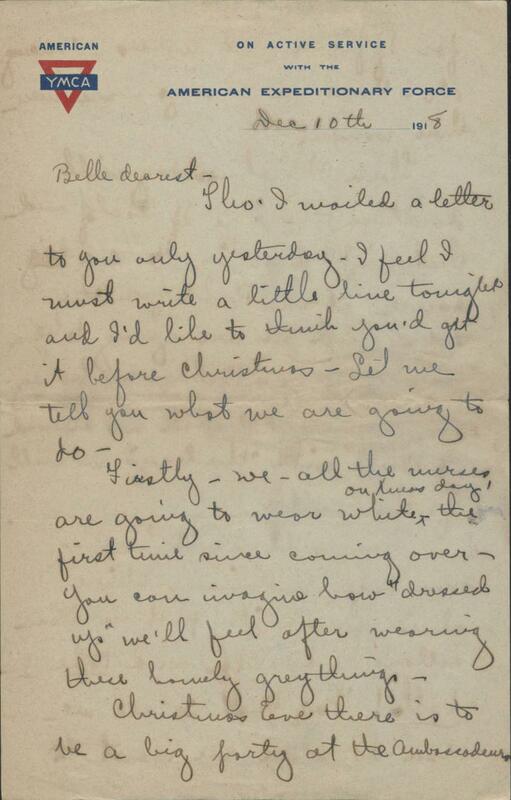 There are also letters mixed in from her brother Peter Doub, who was also serving in WWI. Laura Doub is one of 203 North Carolina nurses known to have served in WWI (though the number is far higher than that). Her name appears on a list of North Carolina nurses who served in the war, housed in the State Archives of North Carolina. This list was transcribed by and posted online through Appalachian State University’s website North Carolina Nursing History. You can learn more about Laura Doub and her family from the Bennet T. Blake Papers (PC.1554), in the Privates Collection at the State Archives of North Carolina in Raleigh, N.C.